Diamond Comic Distributors has started its roll-out of sales charts for the final month of 2009, and Blackest Night has again topped the list of comics ordered by comics shops. The sixth issue of the series joins several other DC "Blackest Night" spinoffs on the Top 10 list, seen here. DC also topped the trade paperback list with the eighth reprint collection of Ex Machina. 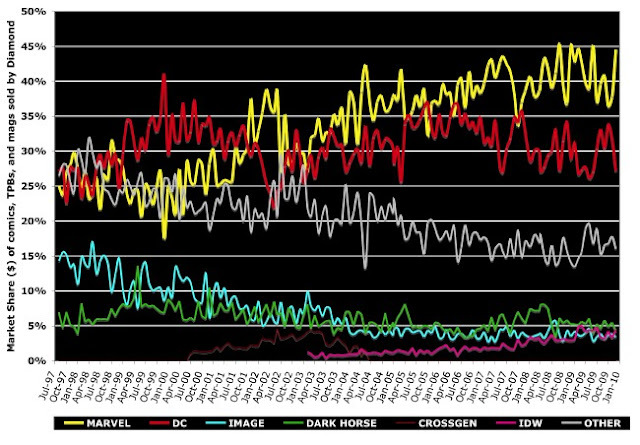 Marvel approached 50% of the units sold in the direct market, including comics and trade paperbacks; in dollars, the gap between Marvel and DC was narrower. The release of the December information allows a complete look at what happened to dollar market share for the major publishers for the decade. The long track can be seen below; click here for a more detailed track of recent months. If the schedule runs as usual, the Top 300 release should follow early next week; The Comics Chronicles estimates will soon follow. There should also be composite end-of-year tables from Diamond; last year's came out on January 12.